Do you have a minute to spare to learn some English? 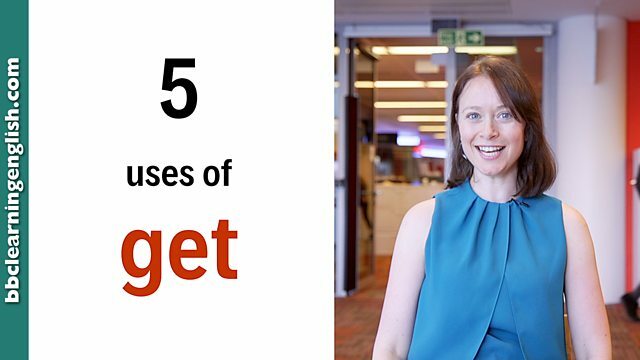 See Sian explain five different uses of 'get' - and one very bad joke! Give us 60 seconds and we'll give you the English! Hi, I'm Sian from BBC Learning English. Today, I'm going to give you five uses of the verb get. So you get five lessons for the price of one! Number one – get can mean buy or obtain. I got myself a new phone last weekend. Number two – get can mean receive. I just got a message. Number three – get with an adjective can mean become. Ugh! So many messages! I'm getting really annoyed! Number four – get can also mean understand. Hang on someone's just sent me a joke… I don't get it! ‘In tents!’ I get it! Number five - get can also mean arrive. I need to get home early so I'm off! Get can mean buy or obtain. I got myself a new phone last weekend. I need to get some new clothes. I just got a message. I got a bike for my birthday! Get with an adjective can mean become. It's got quite hot in here suddenly. I don't get this joke. I don't often meet people who get this type of movie. I need to get home early so I'm off! What time will you get here? Use the context to understand. What do people often get on their birthday? What does 'get' mean in this sentence: I didn't get anything on my birthday. This kind of word describes things. What kind of word do we use with get to mean 'become'? If someone explains something, but you don't get it... do you comprehend? What does this sentence mean? He explained the report, but I didn't get it.